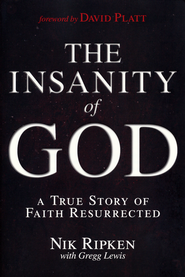 I recently read The Insanity of God by Nik Ripken (pseudonym) and found it to be a tremendously impacting book. I have known the Ripkins for nearly 20 years, having served as pastor to members of Nik’s family. I also assisted with the memorial service when their teenage son died unexpectedly from an asthma attack while they were serving as missionaries in Africa. The book is a powerful telling of the Ripkins’ journey as missionaries, researchers and encouragers to persecuted believers throughout the world. I highly recommend it. If you go to a Southern Baptist church and have ever doubted the worthiness of your investment in the Cooperative Program, please read The Insanity of God. The book is not about CP but is a dramatic and powerful illustration of how God has used the generosity of Southern Baptists to shape a man, his family, his life’s work, and literally impact the world. Nik, who was raised on a farm in Kentucky, was called by God to ministry and attended a Baptist college supported by CP. Once there, God began directing Nik toward mission work when he met “a real live missionary” who was, in all likelihood, supported by CP. Nik further prepared for ministry at The Southern Baptist Theological Seminary where he completed two degrees funded by — you guessed it — CP. The Ripkens then made their way to Africa to invest their lives in sharing Christ among the nations. Their work was made possible because Southern Baptists invested in CP to support them on the field. Because of CP, Nik was able to help oversee the humanitarian relief efforts in Somalia during the early 1990s, one of the most massive relief projects in history. His experiences were instrumental in God directing Nik to begin researching how the Christian faith manages to survive and often thrive in persecution. Nik’s discoveries are fascinating, inspiring, heartbreaking, and life-changing. Nik continues his work today, as do tens of thousands of Southern Baptist students, professors, church planters and missionaries, because Southern Baptist churches continue to give through the CP. We bear witness to the power of the resurrection of Jesus Christ…together! This entry was posted in Cooperative Program, International Mission Board, Missions and tagged Nik Ripken, The Insanity of God. Bookmark the permalink. Both comments and trackbacks are currently closed.